An American fine dining establishment which originated in Beverly Hills 75 years ago, Lawry's has since expanded beyond America to Tokyo, Osaka, Taipei, Hong Kong and Singapore. Though there was a change in location from Paragon Shopping Centre when it landed on our shores in 1999 to the current location at Mandarin Gallery in 2010, what remain unchanged is the grand and majestic feel of the restaurant you'd get as you step into the space set in luxurious hues of brown, gold and champagne, completed with red velvet upholstery chairs and sparkling chandeliers. 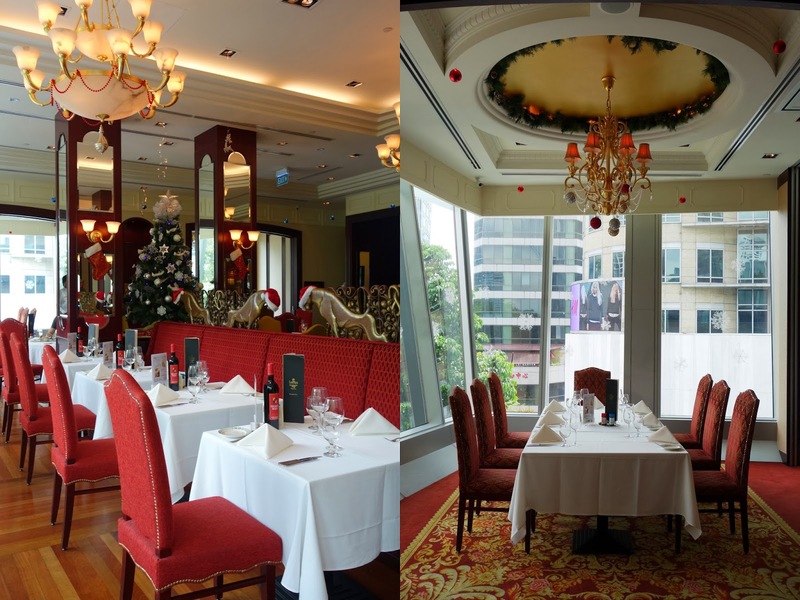 Spanning a spacious area of 6500 square feet, Lawry's premises include a grand bar, main dining hall, all-day dining room and six exclusive private dining rooms, all artfully divided, with panoramic views of the bustling Orchard Road below which is especially gorgeous during Christmas season when the street will be decked in full glory of festive lights. The whole ambiance is really elegant and charming in a classic way, yet cosy enough with none of the "please-super-mind-your-manners" kind of stifling feel. Perhaps that's why Lawry's is also quite popular for solemnizations, corporate events and even children's birthday parties! The initial plan was to go for the 1-for-1 main course birthday month promotion, but when I saw the 2-course Festive Power Lunch, my mind was changed. Available from Mondays to Fridays at only $42 per person with decent choices of appetizers and main courses, and options to beef up (pun intended) the meal with a selection of sides, dessert & beverage at an additional cost which is not too unreasonable, we deemed it to be a rather attractive deal too. We started with some Freshly Baked Classic Hard Roll. Though it was warm and nice when eaten with butter, it's the last thing I wanna fill my tummy with as I'm keeping the space for more scrumptious food ahead such as the highly pleasing appetizer of Traditional Lump Crab Cake (add $5). Coated with breadcrumbs and deep-fried to a deliciously hot and crisp exterior, the filling of crab meat is wonderfully creamy and flavorful. Major like! Mushrooms are my weakness so the the order of Mushroom Sizzler (add $12) was made naturally. Served sizzling hot on a heated plate, the assorted mushrooms were aromatic with its earthly notes. Though it came up a tad short in taste, there's nothing which a dash of Lawry's in-house table seasoning salt wouldn't enhance. 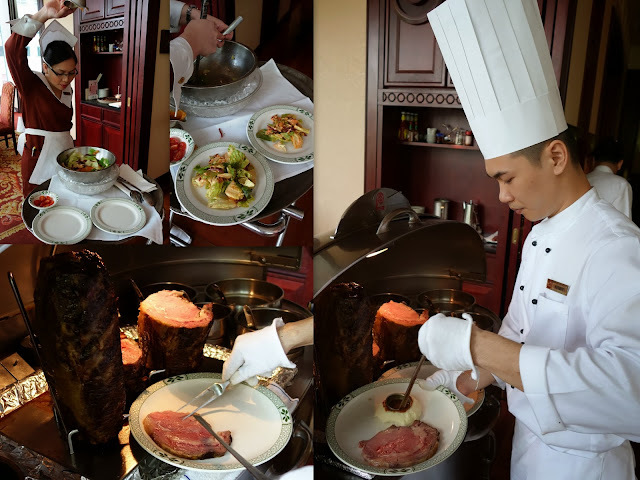 One starter not to be missed is Lawry's Famous Original Spinning Bowl Salad which is prepared by the tableside. Even if you do not like your greens, you'd be entertained with a server dressed in fancy waitress costume dramatically spinning a medley of crisp romaine, baby spinach, shredded beets, chopped hard-boiled eggs and croutons in a large metal bowl atop a bed of ice. Served on nicely chilled plates with a light vintage dressing similar to Thousand Island, the salad is simplicity at its best. But of course the main attraction is undoubtedly the Signature Roasted USDA Prime Rib of Beef. Specially selected, then aged up to 21 days to heighten natural tenderness and slowly roasted on beds of rock, every standing rib roast at Lawry's is served from their silver carts and carved to order to suit various degree of appetite. The set lunch cut is unfortunately only a miserly 120 grams (must knock myself in the head for being a careless speed-reader). As I made a mental note to simply go for a bigger cut from the ala-carte menu next round, the thinly sliced rib roast, done to a pinkish medium rare perfection, actually soaked up the delish beef gravy very well and was satisfying with its delectable tenderness. Lawry's also has in their repertoire, main courses such as Seafood Pasta ($36), Honey Glazed Lamb Rack ($66), US Kurobuta Baby Rack Ribs ($56) and Pan-seared Chicken & Foie Gras ($63) to suit non-beef eaters. We ordered the Champagne Cajun Fish & Chips ($36) which didn't score much points aesthetically, but won itself a pass more importantly in the taste department. The Cajun marinated bocourti fillet was encased in a "more-atas-than-beer" champagne batter and deep-fried to a super crispiness. A delightful combination of moist smooth fish meat and lovely sound of crunch at each bite. To complete our lunch, we also opted for Dessert & Beverage (add $10), which comes with a serving of Traditional Bread Pudding and choice of Finest Italian Coffee or Gryphon Artisan Teas. Even though I did not utilize the birthday month special deal, the staff still presented me with a slice of Lawry's signature dessert, Strawberry English Trifle, sang me a birthday song and took a photo which was then printed and framed into a physical memory. Decent food, nice gestures and impeccable service. I don't mind having a meal here for the many birthdays to come. 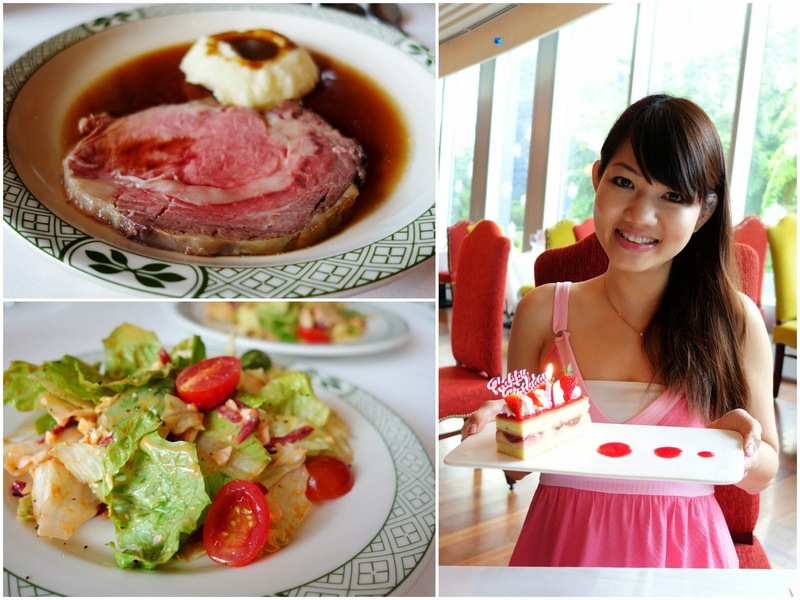 Best 10 Dining Experiences of 2013!